One of the great pleasures of being a contributor here at Quill & Pad is that it gives me an excuse to set aside other priorities on a regular basis and immerse myself in the world of macro watch photography. The results are great fun to share, and along the way I’ve been asked by a number of folks to reveal some of the techniques that I use to create the images you see in my articles. While space won’t permit a comprehensive tutorial, and I’m going to light tent shooting rather than wristshots or other types of images, I’m pleased to pass along some of the wisdom that I’ve been fortunate to receive over the years as well as talk about some pet peeves of mine when looking at my own and others’ photographic efforts. I’ve been shooting on a fairly regular basis for more than ten years now and, among other things, have benefitted greatly from the tutelage of watch collector, professional shooter, and now watch entrepreneur and occasional Quill & Pad contributor Ming Thein (see Design Your Own Watch? A Collector Explains The Pros And Cons With Ochs Und Junior). Light (and shadow): the directional lighting that brings depth to two-dimensional images and in macro work brings us inside the mechanical world of the watch. Subject and isolation: ensuring that the subject of the image is obvious and clearly distinct from other elements of the photo. Composition: using objects and space in a considered way to create interest. Idea/story: capturing imagination and evoking emotion. Light is first on the list for a reason: if I look at my own images and divide them into ones I like versus the “meh” category, good lighting is by far the leading determinant. In the photo above of Tim and Bart Grönefeld’s splendid 1941 Remontoire, the light is directional enough (with a dominant light shining from the left and a fill light from the right) to give a sense of dimensionality and make the highlights pop. It is bright enough to make the strap visible and to keep the black dial from appearing as a murky blob, and at the same time diffuse enough that the bright case and applied markers are not “blown out” visually. Trust me, making all of that happen at the same time was not easy! Directional yet diffuse light was also the secret to the image above of the reverse of the same watch; it would have been really easy to blow out the lugs on the left side, and in fact in several of the shots I took the light from the right, which was too bright, making those lugs scream “look at me!” when of course that isn’t what the shot was supposed to be about. Scattered light can be your friend or your enemy: I spent years figuring out how to banish the light reflected from watch crystals from my images and then slowly re-introduced scatter to give a sense of depth to some images, particularly those of dark-dialed watches. Early on, I really struggled both with directionality and blowouts, and the latter is a real pet peeve for me when I look at watch photos posted online. In the worst cases, photographers overwhelm watches with too-bright and ill-placed flashes that make us look everywhere except where we should. That brings us to the second “thing”: making sure that the viewer’s eye is drawn to an evident and clearly isolated subject. It would be tempting to label my photo above “tourbillon detail,” but in reality it’s not at all clear from my use of focus and lighting what the subject is supposed to be. The balance spring and its anchor as well as the number 42 seem to be in focus, but otherwise this image is sort of a mess (and, by the way, some of the cage highlights are blown out). Just because a photo is a super close-up with some blurry bits doesn’t make it art! 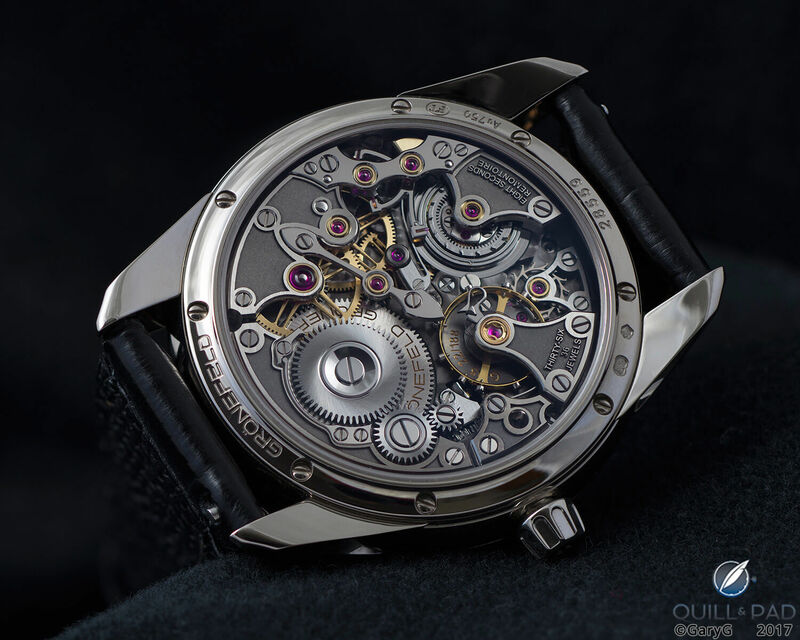 Pet peeve number two for me is the plethora of watch photos online that bear titles such as “escapement view,” but in them the escapement is a blur and some irrelevant wheel elsewhere in the movement is in sharp focus. For comparison, take a look at the photo of the constant torque mechanism of the Romain Gauthier Logical One below, in which it’s pretty evident what we are supposed to be seeing. At the extreme, subject isolation can also communicate mood. Quite often, the “parting shots” I use in my articles are fairly moody and use both light and depth of field to draw our attention to one element of the watch. I doubt that I’m going to bring much in the way of news to the classic topic of composition other than to say that while I was a bit concerned at first that studying the formal rules of composition would somehow make me “less creative” as a photographer. That fear turned out to be completely unfounded as having a structured starting point has actually freed me to try some unconventional approaches. I like filling the frame with steeply raked views of both movements and dials, as in the photo above (which is actually a stacked image built up from several individual shots), but like my teacher Ming I also enjoy using negative space as I did in the first photo in this article and in the Jaeger-LeCoultre Futurematic shot below. Props can both lend interest to a shot and help with composition. I’m still in the early stages of getting really comfortable with props, but not too surprisingly my emerging style is a fairly sober one in which one or two props support (in some cases literally) the watch that is the center of attention. At the end of the day, pleasing composition is about what looks good to your eye as the photographer, and I’m not reluctant to put some shots out there that look great to me but that may seem fairly unconventional. 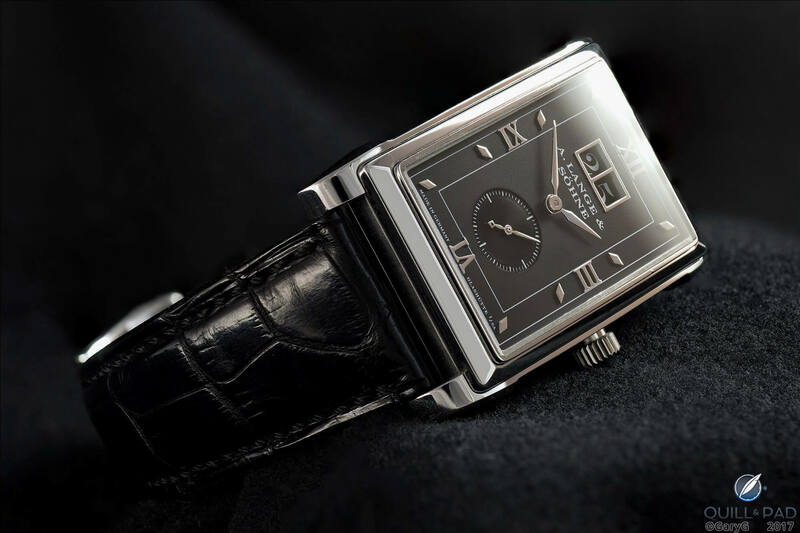 For instance, the image below of the sweeping lines of the Patek Philippe Reference 5370P’s case breaks a lot of the classical rules, but it looks just right to me and (at least for me) communicates my appreciation of just how beautiful this hunk of metal is. For that final bit of gravy, think about what idea or story your image conveys about your watch and what it means to you. Sometimes the theme is immediately evident and can be supported by the use of appropriate props; other times all you need is the right watch and the right light, as in the shot of the F.P. Journe below that at the same time reveals both the watch’s age and lifetime of use and its stunning, textured yellow gold dial whose subtle patina is the beautiful result of that same experience. On those flattering occasions when folks see fit to compliment one of my photos, what I hear more than anything else is that it’s evident from my images that I simply love watches. And for me, perhaps that’s the best “idea” of all: presenting these lovely objects in a way that expresses my love for their beauty and appreciation for their makers. For goodness’ sake, clean the watch! I typically spend 30 to 60 minutes cleaning a watch before starting to shoot, and even then I find that there are always a few (or more) specks of dust – or all too often, a stray cat hair – that need to be removed carefully from the final image. Pet peeve number three for me is when someone who should know better posts “studio” images of a watch that has obviously not been cleaned. Post-process with prudence: my rule of thumb is to make the watch look as natural as possible first before doing anything dramatic with post-processing adjustments. The Internet is full of over-sharpened, contrast-laden images – while (in my opinion) clear focus is essential, harsh sharpening is ugly. Check those hand positions: 10:10 (or 1:50 for A. Lange & Söhne) are the traditional positions, but if that obscures something you want people to see, consider other options such as the 5:32 I chose for my Futurematic shot. Be selective: as Ming says, they can’t criticize the photo you don’t post! If you shoot for a couple of hours and have nothing you’re proud of, learn as much as you can from it and move on. If you have five great shots, post two first and come back to the others a day or two later to be sure. Try new things and practice! The great news for us enthusiasts is that we’re not professional shooters, so our signal-to-noise ratio can be fairly low. Try shooting a single watch in one position with ten different lighting setups and go from there. I hope that at least some of these musings are helpful to you and I look forward to reading about your own views and experiences in the comments section below. Hi, Gary. Thanks for your generous sharing. I think your photos are among the best on the internet. Really enjoy your hard works. Thank you very much for commenting and for your kind words! They motivate me to keep practicing — and it is a pleasure to share the results with you and others. Any tips for shooting macro shots of movements? My biggest issues are sometimes trying to get real close to the caliber for a shot! Every camera has limitations on how close it can get to a caliber to capture a great macro, which leaves two solutions: use specialized macro lenses (or cameras with macro settings like the Leica Typ 109 I use for wrist shots) or use a camera with enough pixels on the sensor (like my Nikon D810) that you can shoot from a longer distance crop the image and the macro is still sharp. One trick if you are shooting with your phone is to hold a loupe in front of the phone’s camera, which makes your own impromptu macro lens! I have a Loupe System loupe with phone adapter, which has super optics and does the same thing, but I’ve seen lots of folks utilize the lower cost solution of using a give-away loupe held to the back of their phone. Try some experiments and let me know how you progress! I’m glad that the article was timely, and I hope that it is a useful reference as you begin shooting with your new kit! For me the number one challenge when I first started to shoot with a tabletop tent was avoiding the tendency to “blow out” the highlights — once you can master the use of diffuse (but still directional) light, you’ll be well ahead of many other shooters whose photos one sees online. Buying a Leica setup. Your recommendations? Sorry for the slow response! Delighted you liked the images and that the ideas were useful for you. I have to confess that I’m not an expert on Leica cameras and lenses — my only Leica is the point and shoot DLux that I use for wrist shots. As a general rule I’d just be sure that you select an appropriate macro lens that lets you get close enough to the watch (in focus) that the watch fills most of the frame. There are lots of good lenses out there that have minimum focus distances that are too long! Regardless of which camera you choose, though, I would suggest that you invest in a strong enough tripod and head to ensure stability — the less glamorous parts of the setup are really important!